Since his arrival at The Daily Show in 1999, Jon Stewart has become one of the major players in comedy as well as one of the most significant liberal voices in the media. 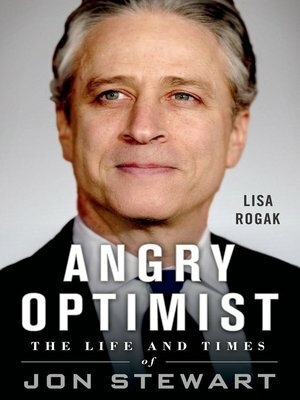 In Angry Optimist, biographer Lisa Rogak charts his unlikely rise to stardom. She follows him from his early days growing up in New Jersey, through his years as a struggling standup comic in New York, and on to the short-lived but acclaimed The Jon Stewart Show. And she charts his humbling string of near-misses—passed over as a replacement for shows hosted by Conan O'Brien, Tom Snyder, and even the fictional Larry Sanders—before landing on a half-hour comedy show that at the time was still finding its footing amidst roiling internal drama. Once there, Stewart transformed The Daily Show into one of the most influential news programs on television today. Drawing on interviews with current and former colleagues, Rogak reveals how things work—and sometimes don't work—behind the scenes at The Daily Show, led by Jon Stewart, a comedian who has come to wield incredible power in American politics.